New York Giants rookie quarterback Kyle Lauletta pleaded guilty on Tuesday to a disorderly persons offense stemming from an October incident, ESPN reported. Lauletta also admitted guilt to tickets for an improper turn and disregarding an officer's instructions in a proceeding at Hudson County Court in Jersey City, N.J. Another disorderly persons charge and an eluding police charge were dropped. 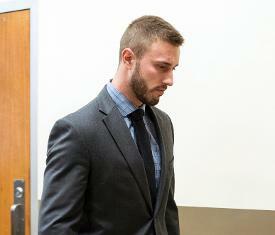 All charges will be dropped if Lauletta remains out of trouble for the next 12 months. Lauletta was arrested Oct. 30 at approximately 8 a.m. ET as he was driving to the team's practice facility in East Rutherford, N.J. The Weehawken Police Department said in a press release that day that Lauletta was observed operating a 2017 Jaguar "in a dangerous manner in heavy traffic" and nearly struck an officer while attempting to evade him. "Upon being directed by an officer to continue in his marked lane, Mr. Lauletta attempted to evade him, making an illegal turn and continuing towards Route 495, almost striking the officer," the statement said in part. "Mr. Lauletta was subsequently stopped by another officer and refused various instructions to provide his driving credentials and exit his vehicle. "He was then arrested and charged with eluding police, a third-degree crime, obstructing administration of law, and resisting arrest, which are disorderly persons offenses. Motor vehicle charges are for reckless driving, disregarding an officer's directions, improper turn in marked traffic lane, and failure to remain in a marked lane." The police statement said a 2017 Jaguar registered to Lauletta was involved in a similar incident the previous day in the same location and didn't stop at the scene. The Giants reportedly fined Lauletta for the incident. The 23-year-old Lauletta appeared in two games this season. He was 0-for-5 passing with an interception against the Washington Redskins on Dec. 9 and didn't attempt any passes in his other appearance against the Dallas Cowboys on Dec. 30. Lauletta was a fourth-round pick out of Richmond.